Machinery Lubrication recently issued its annual Lube Room Challenge for readers to submit exceptional lube rooms that incorporate best-practice features. A number of readers were proud to show how their lubricant storage and dispensing methods have been transformed. The following entries showcase how designing a proper lube room is one of the first steps to achieving lubrication excellence. Samarco is a privately owned Brazilian mining company that produces iron-ore pellets. In 2010, the management team decided to drastically change their lubrication practices, as they realized this was an area in need of improvement that could bring great results. Their plan involved several changes, with one of them being a new lube room. In early 2014, Samarco began making modifications. By the end of the year, the new lube room was completed. However, it is now more than just a lube room. With a training room and a modern onsite laboratory, it was designed to hold the lubrication technicians and all members of the team. Previously, the lube room was partially open and exposed to a very dirty environment. Access to the room was not controlled. Lubricants were poorly handled, and funnels and buckets were often used. New lubricants were not sampled or filtered before use. There was a lack of receiving procedures, quality control and spill containment. Breathers were not used on drums or containers of new lubricants. One filter cart was utilized to filter all types of lubricants, and it only removed particles and did not have the right filters for the task. New oils that were filtered were stored outside. The onsite laboratory had old equipment and could only perform a few tests. In addition, the lab had no ventilation, and several chemicals were stored inside. Lubricant identification was also poor, as unmarked oil and grease drums were frequently seen. After all the changes were made, the new lube station featured different rooms for the treatment of used oil as well as for receiving and treating new oil. New oil is pumped through hard piping to the treatment room. Now only the filtration technician has access to the treatment room. There is also a new lab, a training room, offices and a storage room for filters, breathers, quick-connects, etc. All storage cabinets for chemical products are also fireproof. There are four offline absolute filtration stations for used oils and 12 stations for new oils. Each has three minimess valves to draw samples. Oils are delivered to reusable containers by individual reels. An identification system was created with colors and shapes for all oils and greases. The spill containment for each container has the same capacity as the container. 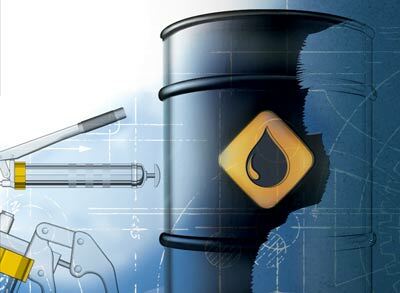 If the container leaks, the oil goes to an external container with a 2,000-liter capacity. The new onsite lab has modern equipment and a technician who is able to quickly test new and used oils. There’s also a storage area for lubrication-related materials such as breathers, reusable containers, Zerks, etc. 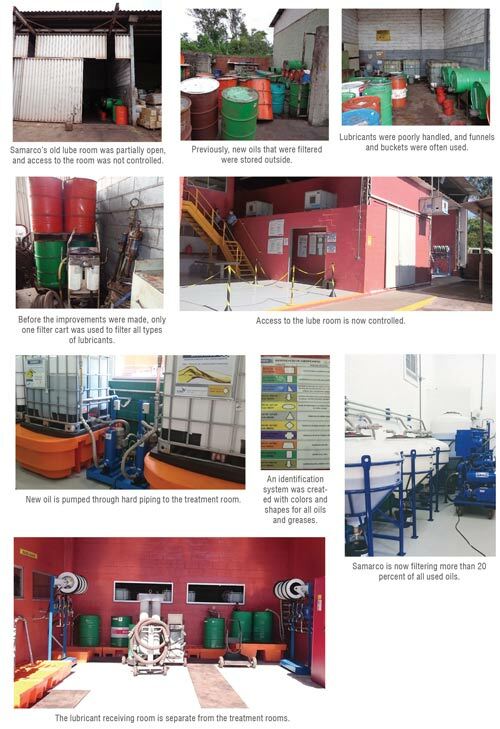 By filtering its new oil, Samarco has been able to extend oil change intervals, as lubricants are delivered to machines with the appropriate cleanliness levels. Great River Energy is a not-for-profit electric cooperative that generates and transmits electricity for members in the suburbs of Minnesota’s Twin Cities, up to the Arrowhead region and down to the southwestern portion of the state. The electric coop recently performed a makeover on its lube room, which resulted in the consolidation of oils from 12 varieties to eight. This not only decreased inventory but also reduced confusion and lessened the chances of cross-contamination. 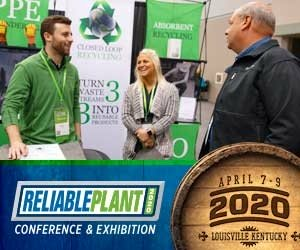 For bulk oils such as turbine oils and hydraulic fluids, Great River Energy purchased 120-gallon totes that can be easily and safely transported to the point of use. Breathers were also added to the totes to inhibit moisture ingression. When needed, oil is now pumped into sumps using a filter cart. For smaller oil quantities, color-coded dispensing containers were acquired for each oil type. To help identify the oils, color-coded labels have been applied to all equipment in the field and a color-coded chart is displayed in the lube room. A new shelving system has also been installed to maximize storage space. Shoco Oil’s new bulk lube facility in Colorado Springs, Colorado, was built to store and produce lubricants for the Rocky Mountain region. It was designed utilizing industry best practices to ensure that product integrity and oil cleanliness are not only achieved but also maintained. The facility includes 10 8,000-gallon atmospheric-controlled tanks, for a total capacity of 80,000 gallons. Incoming oil is unloaded through temperature-corrected meters into the storage tanks. The piping for each tank is painted in accordance with the product color-identification policy. All oils coming into the facility are pumped through individual filter canisters before entering the bulk tanks. Tank inventory levels are checked by a re-transmittable tank monitoring system that can be viewed remotely. 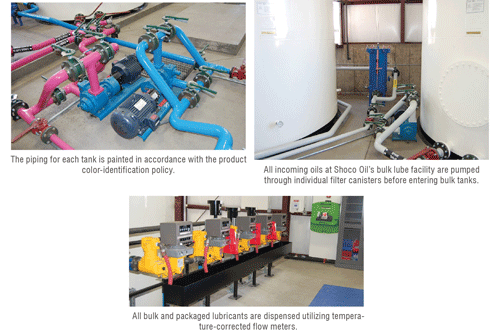 The facility also has installed an in-line filtration system for each of the bulk tanks. This provides the capability to achieve the ISO codes that meet the manufacturer’s requirements. All bulk and packaged lubricants are also dispensed using temperature-corrected flow meters and are confirmed with certified scales.